NIRVANA drum technicians, Barrett Jones and Mike Dalke, talk to Alex Roberts about Dave Grohl's drum rig—Exclusive! This was Dave's kit '90–'91; it was demolished at the Cabaret Metro, Chicago, 10/12/91. This kit was used for the remainder of the US Nevermind tour. 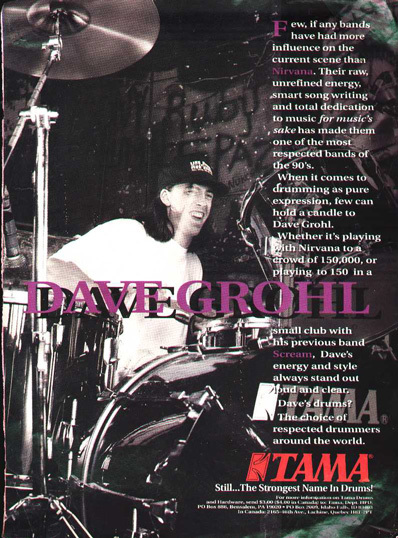 This was Dave's chief set-up for the In Utero tour, a Tama Rockstar-Pro also saw a lot of road. Barrett Jones: Dave used only Zildjian A's (the one time he used something else was with Scream when he had a 28" Paiste for a Ride/Crash. They didn't make many of those and he broke that one within a year!). Jones: We only used Aquarian Hi-Energy heads on the snare as it was the only brand that wouldn't break. The Tom heads were Remo Pinstripes on the top and Clear Ambassadors on the bottoms (these heads were changed before every show). The Kick head was a Remo Clear Powerstroke II, and on the outside was usually an Ebony Ambassador with a 6" hole off-centre. Jones: Mostly Tama, but we had a special Hi-Hat stand by Sonor, since it was the only kind that was tall enough for him; we would have two with us on tour in case one got messed up. Mike Dalke: The thing I remember specifically is that the cymbal stands would be gaffer taped and sand-bagged to the riser so firmly that the force from Dave's sticks would go from the cymbal directly to the spindle at the top of the stand, and the spindles would only last about four shows at the most. I think that Tama may have corrected the flaw but, at the time, it was as if the cymbals would cut right through the metal at the top of the stand. Dave, on two occasions, hit the crash so hard that the top of the stand cracked off and the cymbal came flying into his lap; it looked like some kind of practical joke, but it was real. Dalke: Pretty much every piece of the pedal broke at different stages of the tour. We had three: one on the drum, one on the side for back-up, and one in the workbox for parts. The chains, and the nut that fastened the chain to the pedal, would snap on a regular basis. DW really has increased the durability of these pedals, I think that all of the broken ones from Dave may have caused them to do more improvements. It cannot be overstated how hard Dave is on drums, cymbals and pedals! © 2003–Present: Alex Roberts. No part of this article may be reproduced without the prior written permission of the author.